I admit it. I am a product snob. If you can't buy it at the beauty store or hair salon, I never thought it was "good". A couple weeks ago I was invited to a Suave Hair product home party at Rockin' Mama's house and I admit it, my thought was that I would at least have a great time visiting with some of my favorite Mom Bloggers. Boy was I wrong... and NOT about the just hanging out with friends part. The new Professional Hair Product line is ABSOLUTELY FANTASTIC. Can I quadruple underline that? I mean it! 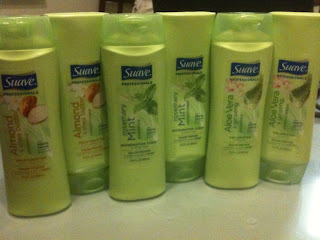 When we arrived at Rockin' Mama's house I immediately saw the take-home bags and what is the first thing women ALWAYS do when checking out shampoo & conditioner? Pop the top and smell them of course! Instantly we were in love. DayTrippingMom's first response when smelling this bottle was that it smelled just like Aveda. After looking over the product we all started laughing because it clearly stated on the bottle that it works just like Aveda! I've now tried it and LOVED all of the products they sent us home with that night. For the record, I love the line so much I have now gone out and purchased some of the ones they didn't send with us. I'm hooked and in love with all of them. They have ones that emulate Biolage, Matrix and other very well known and popular products for a fraction of the cost. Literally. The bottles sell at $1.79 for the normal size and just under $4.00/bottle for the supersized ones. I've found my absolute favorite orange Sleek Line product from Matrix and am thrilled at the cost savings. I will never pay the outrageous costs for shampoo and conditioner again. I've found that Wal-Mart has the best selection of the products as compared to Target, but the prices are equal. 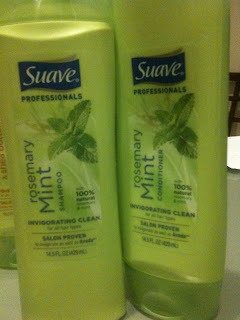 Suave is also getting ready to launch a Professional Styling product line that we sampled that night that also emulates salon quality products. I can't wait to be able to purchase those and promise to let you know as soon as they are available. I seriously think these products are the find of the century for those looking to have the same quality of products and save money at the same time. If you haven't yet, run out, buy some then come back and let us know what you think of them! I know I'm not imagining how awesome these products are. Below is the Whirrl story about the home party created by Rockin Mama that showcases the talents of the celebrity stylist Suave brought in for us. 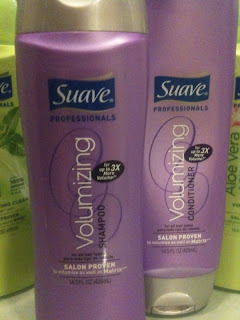 Oh my gosh, I hadn't heard of the new Suave hair care line and I'm so excited! Love the smell of Aveda produts - I'm so trying it!